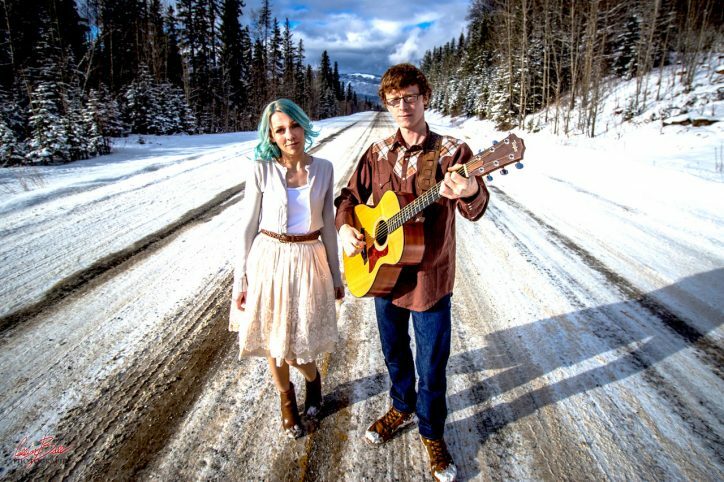 The Mechanical Botanicals are a Welsh/Canadian duo consisting of Lydia Hibbing (Canadian) and James Mannion (Welsh). Based in the picturesque small town of Tumbler Ridge in beautiful British Columbia the pair have been performing as The Mechanical Botanicals since 2016. With tunes to get you on your feet and harmonies to drop you to your knees, The Mechanical Botanicals deliver their own take on roots/folk music! The pair focus heavily on their dynamic harmonies and vocal strengths, blending their voices effortlessly. Combining their individual influences and experiences the pair have a chameleon-like style, allowing them to delve into the blues when needed or cross the line into country as they see fit! The Mechanical Botanicals repertoire of originals and classic covers lend themselves well to the pairs soulful style – all of this packaged up with humorous tales and stories from this duo’s mechanical botanical life. The duo have been busy recording their first EP which will feature 5 original tracks including the title track, ‘The Road’ which was featured on CBC’s Searchlight competition this past spring. During the summer months The Mechanical Botanicals played a slew of shows in the Peace Region, the highlight of which was GrizFest where they shared the bill with notable acts including Monster Truck and Bret Michaels. Look for ‘The Road’ EP to be released in the new year, as well as the duo’s traditional Christmas album – ‘The Mechanical Botanicals present: A Very Botanical Christmas’.